"Cincinnati brings you this classic chili dip--with a McCormick® twist! 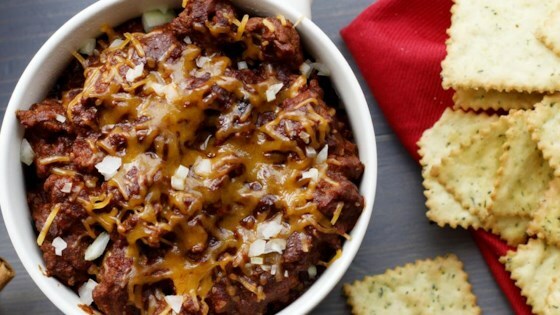 Mix lean ground beef with McCormick® Original Chili Seasoning Mix and cinnamon. Top with Cheddar cheese, onion and serve warm. Master your dip-dunking skills with pasta chips or potato chips." Brown ground beef in large skillet on medium-high heat until beef is no longer pink, about 5 minutes. Drain fat. Stir tomato sauce, chili seasoning, and cinnamon into the skillet. Bring to boil. Reduce heat to low; simmer 10 minutes. Sprinkle with Cheddar cheese and onion. Serve with tortilla chips, pasta chips, potato chips, or French fries.